Inox Laser Art™ creates laser-engraved designs for commercial, residential or hospitality projects. Inox offers personalized engravings in black, white, color and copper reveal options. The vandate diode laser delivers an accuracy of 0.001 mm and creates intricate designs door hardware up to 30 in. for applications such as hotel door plaques and lever sets and corporate logos for offices. Inox Laser art utilizes engraving, ablation and annealing techniques. Only door hardware manufacturer in the industry with a vanadate diode laser in-house. INOX®—creator of innovative and premium decorative hardware and door locks for more than 25 years - debuts INOX Laser Art™, which offers personalized engravings on INOX hardware in four options: black, white, color and copper reveal. INOX is the only door hardware manufacturer in the industry to house a vanadate diode laser, creating this customized laser work on location. Customers can provide virtually any line art and have it reproduced within an accuracy of 0.001 millimeters with INOX’s own Swiss-made vanadate diode laser. 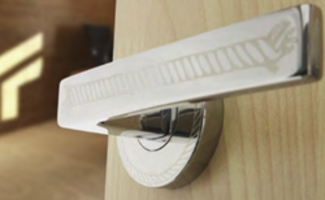 The laser is able to create intricate designs on any INOX door hardware up to 30 inches across for applications such as hotel door plaques and lever-sets, designs on residential hardware, corporate logos for offices and arena hardware for private suites. INOX Laser Art uses engraving, ablation and annealing techniques to offer black, white, color and copper reveal options. With engraving, the laser removes the material and creates a black depression on nearly any material, and colored oxides can be added to further accentuate the marking. Next (for white and color), the annealing technique is created by tuning the laser frequency so it heats metal to a precisely determined temperature, yielding oxide layers in different colors. Lastly, ablation partially removes the coating layers to expose the base material, which is used for the copper reveal option. For more information about Laser Art or other INOX products, please visit inoxproducts.com. INOX is an innovative engineering company that designs and manufactures premium decorative hardware and door locks, including its industry-exclusive Privacy Barn Door Lock. For more than 25 years, INOX has been an expert in door hardware design with a proven track record of supplying product for some of the largest projects in North America, South America and around the world. INOX products are distributed worldwide via a network of more than 500 high-end retail designer hardware showrooms and distributors. To learn more about INOX, visit http://www.inoxproducts.com.